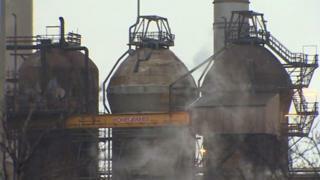 Image caption A new start for Port Talbot? 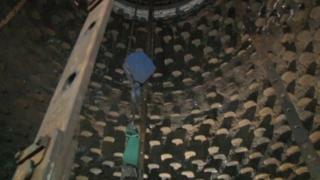 The first new coil steel has rolled out of Tata’s Welsh steelworks – after a £50m investment to refit a blast furnace. The move should extend the life of blast furnace 5 in Port Talbot by seven years and ease concerns about Tata’s commitment to Europe’s steel sector. The firm’s chief executive said it marked the “biggest single investment” in its European steel operations. Tata merged with ThyssenKrupp in June, in a bid to secure Tata’s future. 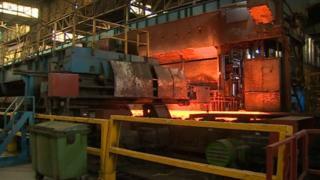 Restarting the furnace will also be welcomed by scores of other businesses in the steel supply chains and manufacturing bases across the UK. Following the relighting of the furnace, the first steel has now been produced and turned into the finished product to be delivered to manufacturing business across the UK, from car makers to ship builders. “What you see today in the blast furnace investment, we are committed to build on our future for the UK,” said Hans Fischer, chief executive of Tata Steel’s European operations. But Mr Fischer said he was “really worried” about a possible hard Brexit. He added: “When you look to our production, more than 70% stays in the UK. So directly the impact of Brexit is maybe not that big. “But if our customers are impacted very heavily then that immediately leads to a disturbance in the supply chain and that immediately leads to disturbances in our productions as well. Engineers drained the giant furnace in the autumn in order to carry out vital engineering work, replacing part of the heat resistant interior and key structural parts. The waste gas and dust extraction system was also replaced before air at 1,200C brought the furnace back to life.